So, here we go, my first review. As one of the â€œnew boysâ€ at DroidDen I was on a mission. To get the bestest, most brilliant device I could get my hands on. Maybe the latest Android tablet, one of the next generation Smartphones. Then along came Archos with a device I would never have dreamed of reviewing in a millennia. With us being about everything Android related, we mean EVERYTHING! 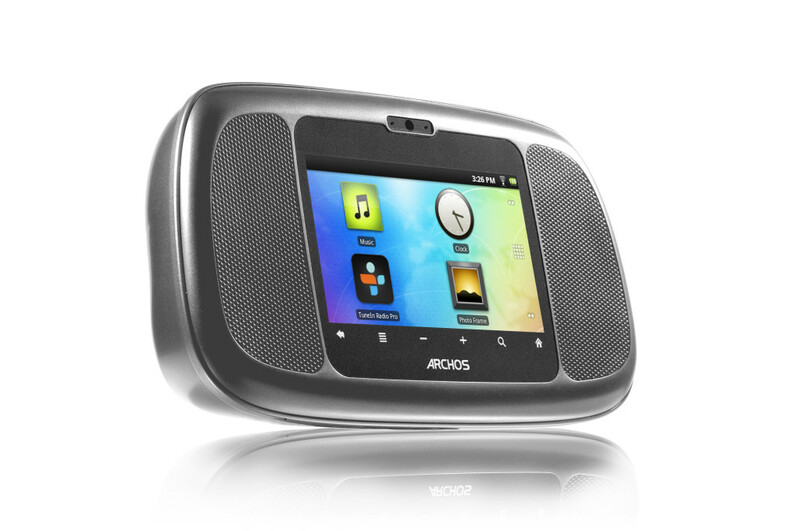 So I agreed to the device being sent and here it is in all its glory: The Archos Home Connect 35. Am I impressed? Find out by hitting the link! Ok, I am not going to lie to you. I purposely wonâ€™t (and donâ€™t) look into too much detail on photos of products that I am going to get my hands on, mainly due to the fact that I want my first design impressions to be of the physical product rather than a professionally taken (and sometimes a little manipulated) photo of said product. When I was told that I was going to get the device sent to me for review my imagination went wild. Ethernet cables plugged in to sockets, a huge device taking up half of the sideboard (which I was already trying to explain to my wife before it arrived! ), and huge cables and transformers trailing to plugs. Thankfully absolutely none of them were true! This is an extremely compact device for the power it produces. A 3.5â€ resistive touchscreen is the main attraction on the front with a mesh cover at either side covering the speakers. This is a very curvy product with hardly a straight edge on it. Following the curves to the back you will find the connections etc. Micro USB is the charger flavour in the device (which made it remarkably easy for me just to plug my phone charger to get up and running) A Micro SD card slot, Aux connector (3.5mm jack plug) and power/reset buttons. This Android-powered device is running Froyo version 2.2.1; a dated version of Android compared to todayâ€™s standards but nevertheless a more than suitable version of Android for this device. It is a fully working version of Android too. Not dumbed down or restricted. On initial playing around it seems that I can do pretty much everything I would expect to be able to do on a Froyo flavoured phone or tablet. Emails, Apps (via Appslib, Archosâ€™ own App Store), YouTube, Videos, MP3s, games everything! Personally, I wanted to use this device during review as what it is primarily made for a web radio, but the clue is in the devices name, This would be perfect for someone who has internet but doesnâ€™t have a computer and want to very rarely get things like emails in the house. Also, with it being Android powered, it means that it can run apps like Skype. Archos obviously have thought of this little benefit too as they saw fit to install a webcam into the front so you can use it to make those Skype calls to friends and family wherever they are for free. Now I donâ€™t use Skype so I couldnâ€™t test but I am sure it works well enough for people who would want to use it on a device like this. The hub of the device is the 3.5â€ resistive touchscreen front and centre on the device. In all honesty the fact that it is resistive is probably the only real let down on the device. With Â£40-Â£50 â€œdumbphonesâ€ now starting to come with capacitive touchscreens it is a shame that one wasnâ€™t put in this device to really polish it off as the finished article. Any time I think of a resistive touchscreen, my mind automatically wanders off to images of punching a Samsung Tocco â€œTaco" F480, Tocco lite or Nokia 5230 and this screen lives up to those expectations. For the lazy amongst us (read: me), Archos have us in mind. 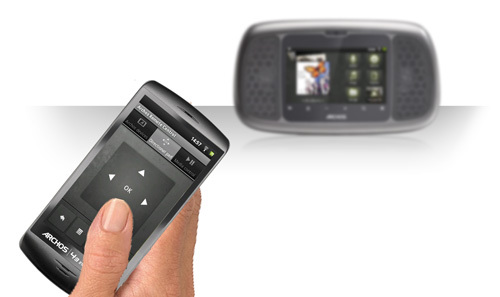 A cool little App for your Android phone called Archos Remote is what they came up with. This app connects to your home connect device via the wifi network and enables you to gain almost full control of the device without disturbing the large round indents you are making on your sofa. You can open / close apps, change tracks / stations, do just about anything. This is definitely a nice addition. As I was saying earlier this is definitely a feature rich device and can be as powerful or easy as you choose it to be. Here is a list of the main features of the device. Internal Battery: This device also packs a battery so you do not have to leave it plugged in all the time (think web radio during the day, alarm clock on bedside table or â€œnightstandâ€ at bedtime). Photo Frame: Use the device as a photo frame showing off your favourite photos and memorable moments. Audio quality on the radio app in comparison to locally stored files. This device is a fantastic addition to a household that wants to either have a value MP3 player or Internet Radio player, or a family that wants a connected home device to use for email, games, video calls and apps. Prices start from around Â£90 on Amazon but can be found on lots of online retailers. I have to say I was very sceptical at first but even only having used it for a few hours, I am sure that this would make a great addition to my living room.